As I mentioned in my last post, I’m working for a few progressive campaigns around Minnesota. 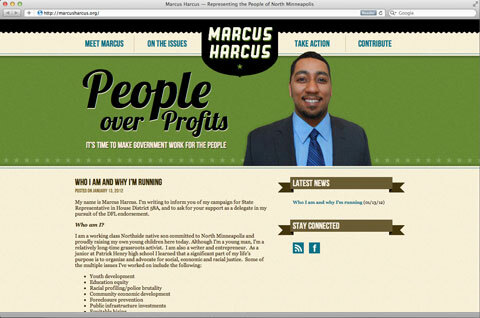 One that I just pushed live is for Marcus Harcus, a progressive activist in North Minneapolis. Marcus is a smart politician with great policy ideas and a lot of youthful energy. Plus, he’s just an overall nice guy and family man. This campaign is important to me not just because Marcus is a good friend, but because he’s running to be my representative, and I think he’d reflect my values well. He is the face of the changing Northside. Good luck, Marcus!